My friends Cassie and Justin invited Sugarface and me to spend a weekend with them at Carolina Beach and generously let us stay with them at their beach house. Justin had spent over twenty years coming to this beach with his family. The two of them have done all the work the past few years eating through the town and were thus the best tour guides for a fun and delicious weekend! I thought I’d share their wealth of knowledge on where to eat around this laidback, beautiful beach town! Our first stop after we drove into Carolina Beach Friday night was to grab a hearty and casual dinner at Flaming Amy’s Burrito Barn. They promise “hot, fast, cheap, and easy”, and I’d like to add dang good. They have a long list of specialty burritos on their menu, and we were all quite happy with our orders. I got the Poboy which had Buffalo Style shrimp, cheese, and jalapeño tartar sauce. And because I’m obsessed with tater tots, I had to grab us a plate of Chicken BBQ Totchos to share. After dinner, we went for beers at Fat Pelican. Fat Pelican is unlike any dive bar I’ve been to. They serve only beers and you pick the beers by stepping into their walk-in cooler and grabbing them yourself! 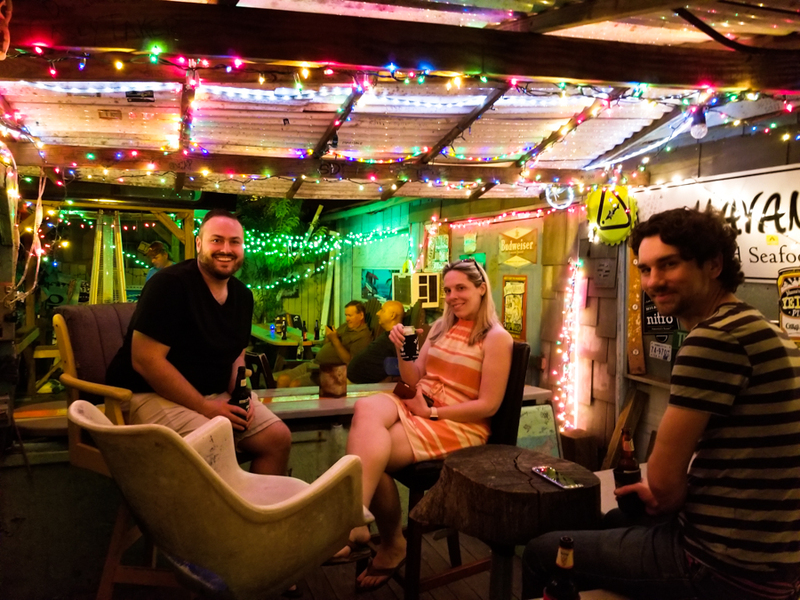 The night air was perfect so we took our brews to their sandy patio with cool beach junkyard style furniture. We chose to climb aboard a docked boat, because boat! I really dig Fat Pelican’s vibe and think you would too. 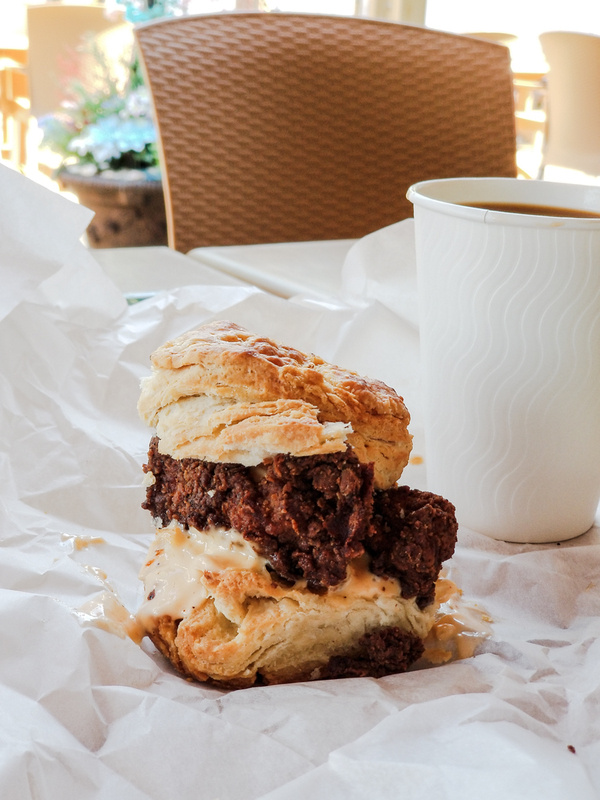 For breakfast, we went to Southerly, an aesthetically pleasing brick and mortar slinging, you guessed it, biscuits and pie. Their biscuit portions are modest considering the going rate in the south but I personally like the smaller portions. I don’t love stuffing myself until I feel like I’m bulging out of my clothes and then going to lay on the beach. Ha! Thank you, Southerly, for teaching me moderation. Their fried chicken biscuit was decent and I was truly impressed by their Moon Pie. Note for dog owners: We brought our dogs but dogs are not allowed on the beach between the hours of 9 to 5 during the busy season. We made sure to introduce our dogs to their first beach early the next morning. After working up an appetite by laying on towels and leisurely walking the beach, we decided it was time for food. 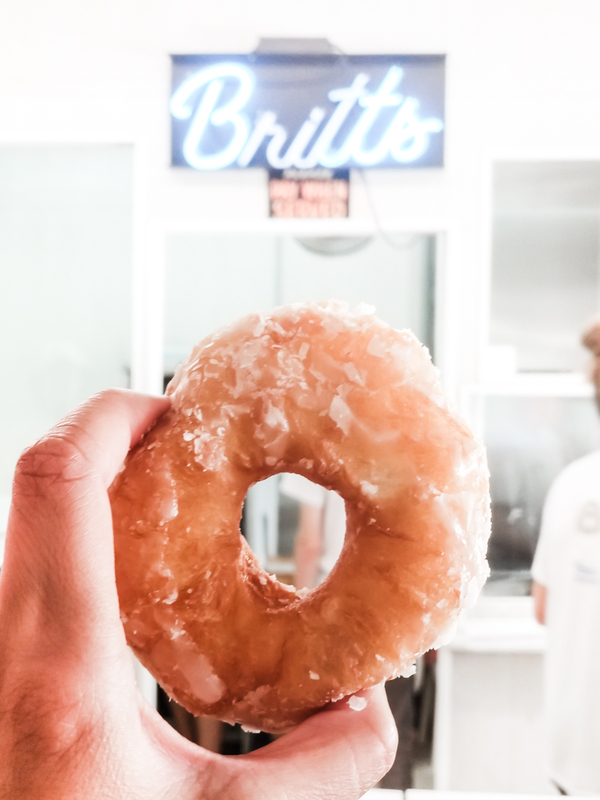 Open since 1939, Britt’s Donuts draws long crowds into their boardwalk storefront with just one thing on their menu, classic glazed donuts. That’s right, that’s ALL they sell and once you take a bite out of their fresh from the fryer donuts, you’ll understand why they don’t need to offer anything else. Please remember that they’re cash only. If you forget to bring cash, it’s worth finding an ATM right away! Trust me. I have your lunch itinerary. You ready? 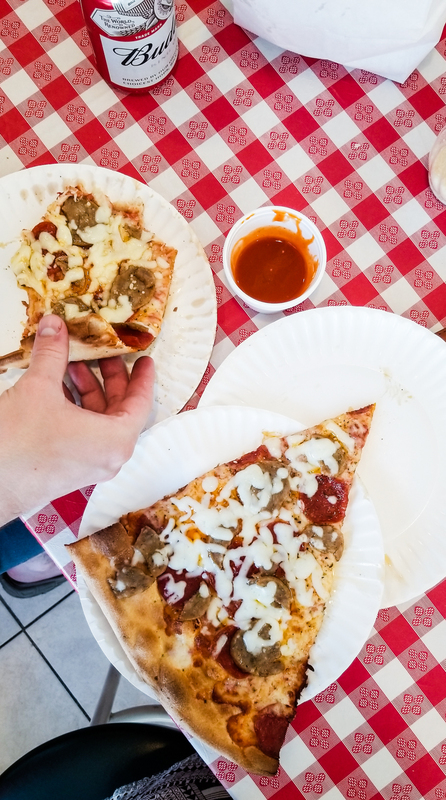 Go to Frank’s and order your slice of pizza. As they bake your pizza, walk immediately to Britt’s next door and grab donuts. If there’s a line at either place, you may have to tweak as needed. Now eat warm fresh donuts as your appetizer, then follow with your greasy and delicious pizza slice, and finally finish with more donuts for dessert. That’s what I did and would do again! I’m convinced this is the only way to properly do it. For our last dinner, Cassie called in reservations at Surf House, an elegant restaurant curating a creative farm to table menu. 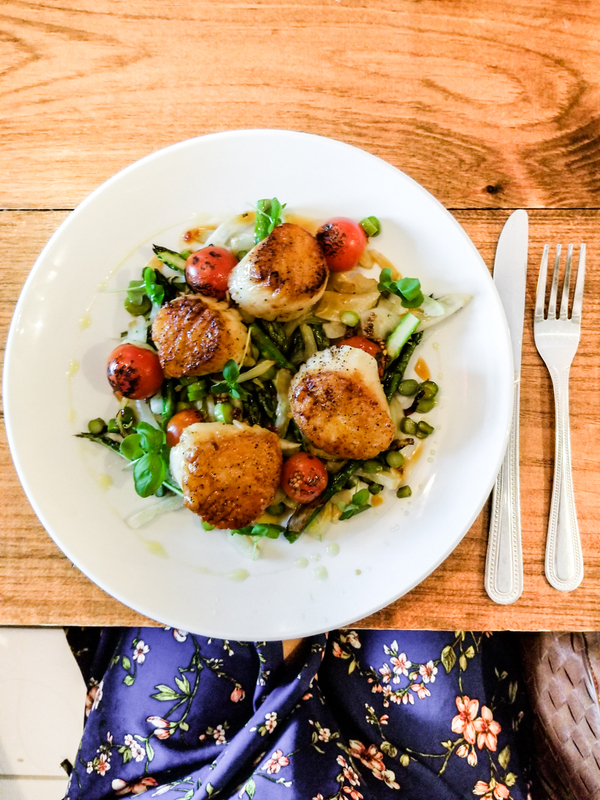 After eating pizza, burritos, and donuts, I was so grateful for a scallops dish, served over an asparagus salad. Their Brussels sprouts appetizer was delightful as well. Sugarface mentioned his duck entreé was the best duck he’s had in a while. Reservations are recommended to dine at Surf House. Oh. I’m still haunted by my experience at Squigley’s. We went Saturday evening and I was so enamored, I suggested it for breakfast the next day. I was heartbroken that they are closed on Sundays! So Squigley’s is not your standard ice cream shop and I have never experienced anything like Squigley’s in all my years of eating ice cream. You essentially can make your own soft serve ice cream here! Put another way, you can have the ice cream flavor of your dreams! So here’s how it works. You ignore the premade ice cream they have at the store. You will order what they call a Squigley, which is a vanilla soft-serve ice cream with your choice of mix-ins. These mix-ins get finely crushed and swirled into your vanilla soft-serve, essentially creating a new flavor. They did the math, there are 4050 flavor options! I chose Fruity Pebble and mango. 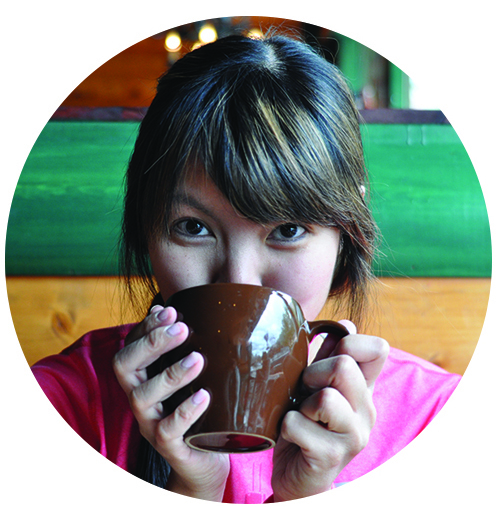 When Cassie explained the process to me, I expected the typical ice cream mix-in experience. I figured there would be Fruity Pebbles folded into my ice cream adding a crunch to my ice cream. But what came out was Fruity Pebble and mango flavored soft-serve! Mind blown. 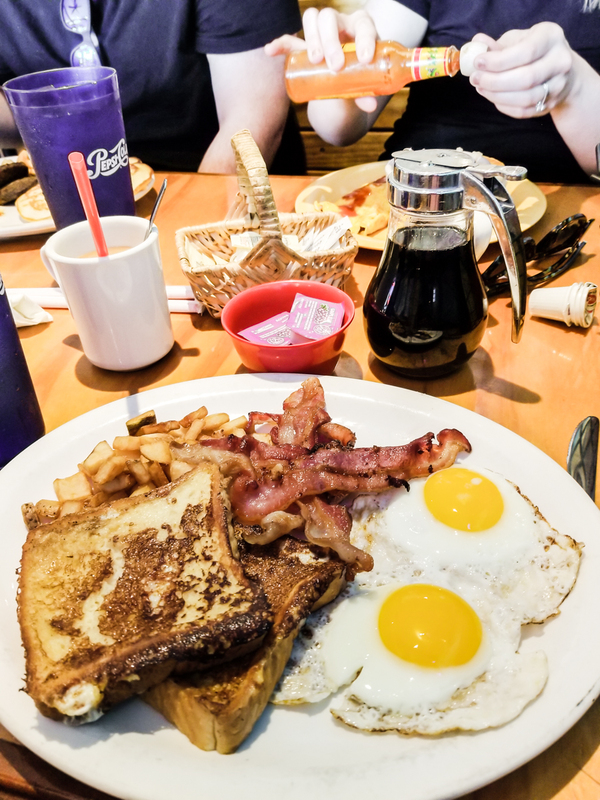 We ended our amazing weekend at Hang Ten Grill, a diner with a humble selection of classic diner breakfasts like omelettes, pancakes, french toast, sausage, and bacon. Simple, hearty, and it didn’t put me off a two-hour drive back home. It’s been a while since I had a true weekend. Where I didn’t do any work and tackle any deadlines and actually prioritized leisurely pleasure. I’m feeling so much gratitude to our friends Cassie and Justin for being the perfect guides and hosts. 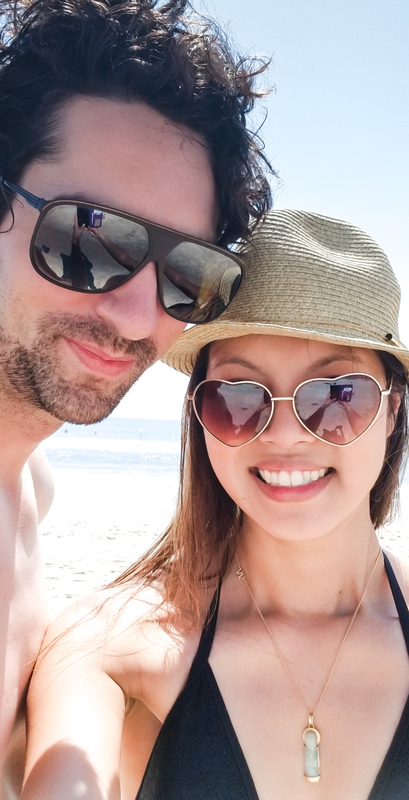 There wasn’t one place we visited that I didn’t want to come back to again, and the beachy air and vibes truly rejuvenated me. I can’t wait to return to Carolina Beach! 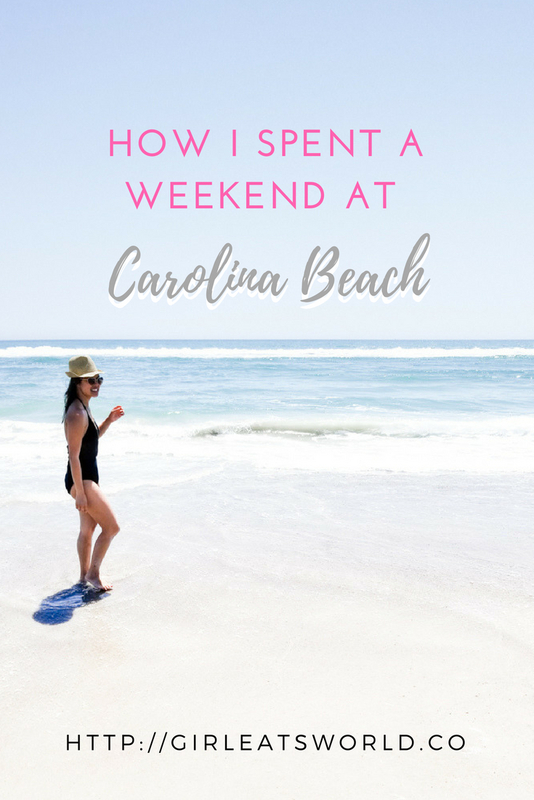 Questions: Did I miss any of your favorite Carolina Beach spots? What’s your dream ice cream flavor?